Does My Company Need an Employee Handbook? Consider this: Even one employee can cause you problems. And the problems multiply exponentially the more employees you have. Image this scenario: Your one employee is consistently late for work; sometimes he calls to let you know he will be late, and sometimes he doesn’t. You want to fire him for continued absence, but your attorney says you have no handbook that tells the employee what to expect about what happens in the case of chronic absenteeism. Trust me; If you don’t have something in writing about this situation, the employee can charge that he didn’t know he could be fired for not showing up on time. And this could lead to a lawsuit. Employees like to know what is expected of them and they want to know that they are being treated the same way as other employees. The perception of unfair treatment can lead to disgruntled employees and, ultimately, to lawsuits. For example, if all employees know how many vacation days they receive, they won’t be wondering if other employees are getting more days. Having the same rules for all employees makes running the business easier. There’s no need to think about what to do in a specific situation. Sure, there are times when there’s no written policy on an issue, but having some general guidelines can help deal with specific situations. Written policies show employees that your business wants to be fair. That intent goes a long way towards good morale in general and in dealing with individual employees who are discontented. Finally, written policies and procedures can help you deal with lawsuits. The policy manual can be used as evidence in a discrimination lawsuit; in fact, such a manual might even prevent a lawsuit. Have an attorney review the handbook for language, for conflicting or confusing language, and for legal issues. For example, your attorney can help you craft language that won’t make employees think they have a job for life. 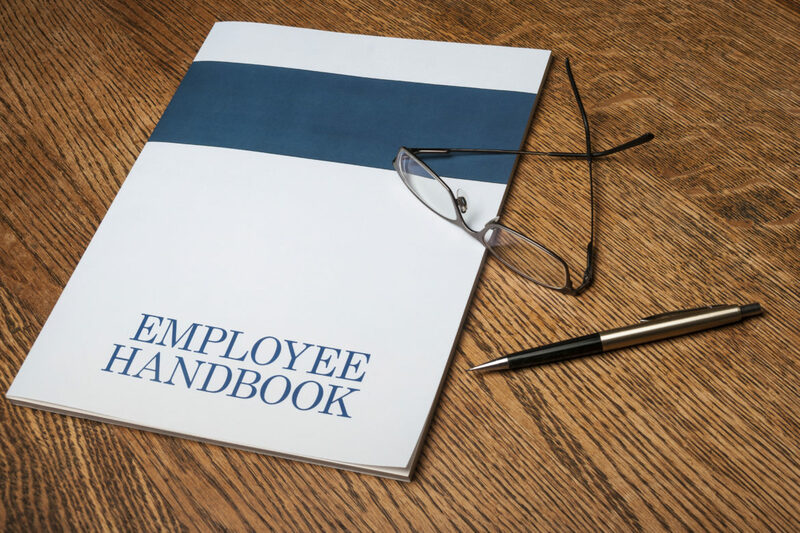 Make sure all current employees know about the handbook and that it is available to them. Give each employee a copy (make sure you get a signature so you can show that all employees have received their copy). Put a copy up on the company website. Remind employees about specific policies. In other words, make sure there’s no way an employee can plead ignorance of the policies and procedures in the manual. Follow the handbook. Take action when you need to. Using the handbook to deal quickly with employee issues reinforces your intent to be fair and your intent to follow the handbook. Re-visit the handbook periodically. Update policies that have changed (make sure you communicate the changes immediately!) and consider other changes to address issues that have come up. If you change a policy and you don’t change the handbook, you’re inviting legal issues. No matter how many employees you have, an employee manual or employee handbook is an essential tool for running your business. So have you created an employee handbook yet? If not, we can help create one to fit your business needs. Dealing with I-9 Forms can be tricky. It’s definitely not the easiest part of your day, and it requires a lot of attention to detail. No one even wants to talk about the possibility of getting audited for your I-9 forms. But what if I told you it was actually pretty simple? 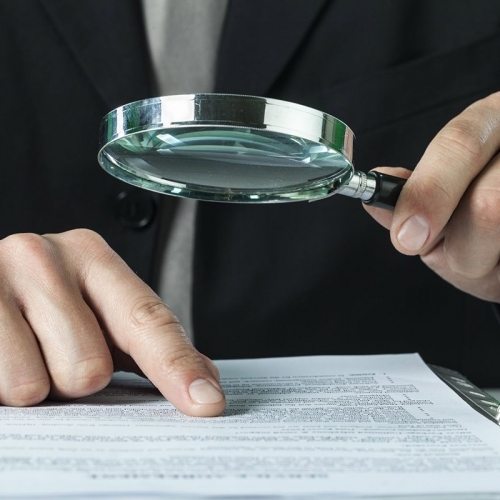 In this blog, I am going to list off the six steps you need to conduct your own internal Form I-9 audit. So if you ever hear ICE (Immigration and Customs Enforcement) knocking on your door, you’ll be ready! When conducting your internal I-9 form audit start off by outlining your procedure and how you plan to conduct the audit. Your internal audit should concentrate on key problems that frequently arise during the completion of the I-9 form. Unbiased – Make sure the selection of Forms I-9 for an internal audit is not based on the employee’s race or nation origin. Either audit all forms, or audit a truly random sample of forms. An organization may not selectively choose which forms to audit. Annual – This provides a defense against allegations of targeted internal Form I-9 auditing. Internal audit processes should mimic government compliance audit processes. This not only verifies Forms I-9 on file, but it also trains the Human Resources Department to prepare for actual government compliance audits. Consistent – Either keep copies of all I-9 verification documents, or none of them. If your records are not complete, then you must either obtain the missing documents, or dispose of all collected verification documents. You’ll need to make sure you’re gathering all of the information below to complete step two, auditing Section One of the I-9 form. For Section Two of the I-9 form you’ll need to ensure one document from List A is included and completed or one document from List B and one from List C are listed and completed. When conducting your internal audit, Section Three of the I-9 form deals with reverification which only applies if evidence of employment authorization (List A or List C document) presented in Section two expires. Step four also covers what to do if you’re missing any I-9 forms. For current employees – require employee to present documentation and complete a new Form I-9 with current dates. Date of hire will be the employee’s actual date of hire, which may have been years earlier. Attach a memo to the Form I-9 explaining the discrepancy between the date of hire and the date of completion of the Form I-9. Sign and date the memo. For former employees – date and attach a memo to Forms I-9 for any terminated employees with missing or incorrect Form I-9 information. Retain it with other Forms I-9. Documenting this demonstrates an employer’s good faith effort to correct the forms by performing an internal self-audit. Errors are bound to happen. Especially when you’re dealing with I-9 forms. But here’s what you do to ensure you keep on trucking! Easily correctable – you may do so on the form. The best way to correct the Form I-9 is to line through the portions of the form that contain incorrect information (preferably in a contrasting ink color), then enter the correct information. Initial and date your correction. Never use white correction fluid. If you have previously made changes on Forms I-9 using white correction fluid instead, USCIS recommends that you attach a note to the corrected Forms I-9 explaining what happened. Be sure to sign and date the note. Not easily correctable – complete a new Form I-9. The old Form I-9 is attached to the new one, along with a note explaining the reason for creating a new Form I-9. Do not throw away the old form. You’ve just completed conducting your internal I-9 Form! But you’re not completely done, yet. There are still a few administrative things you’ll need to wrap up. Photocopies of List 2 documents – if they exist, are attached to the Form I-9 and are readable. It is not mandatory to make photocopies (except in Colorado), but if they are made, they must be kept. If photocopies are made for one employee, they must be made for all employees. Employers enrolled in E-Verify must keep copies of the following documents if they are presented by the employee – US Passport or Passport Card, Permanent Resident Card (I-551), or Employment Authorization Card (I-766). Now you’re on your way to conducting a flawless Form I-9 internal audit. But why was this so important? Recently there has been an increase in enforcement for Form I-9 audits for employers. So what exactly changed? On January 10, 2018, early morning reports of raids by Immigration and Customs Enforcement (ICE) confirmed what had been assumed – worksite enforcement has been increased and employers need to take note. The continued reports of high-profile ICE raids are definitely intentional. ICE wants employers to know that they’ve increased enforcement and they want you to take this very seriously. The current administration also appears to be building upon successful tactics that were used during both the Bush and Obama eras by focusing on administrative arrests of employees and requests for Forms I-9 through a Notice of Inspection (NOI) to employers. ICE conducted 1,279 audits of I-9 forms in 2016 and that number is expected to rise dramatically under the new enforcement focus. Sure this can be scary, but knowing how to conduct your own internal I-9 form audits can help. And the word to remember for this process is “thorough.” An internal audit should include an in-depth review of all of an organization’s Forms I-9. Considering the limited resources and time of an organization, a comprehensive review of all I-9 records may not be feasible. In this case, organizations are encouraged to review a significant and fair sample of Forms I-9 to determine where the majority of errors/omissions occur, how to correct these, and how to implement better training and policies to ensure proper completion and compliance moving forward. For more information on self-auditing guidelines see the Department of Justice publication: Guidance for Employers Conducting Internal Employment Eligibility Verification Form I-9 Audits. Let AZ HR Hub know how we can help your company. To help employers craft handbooks that don’t violate the National Labor Relations Act, the National Labor Relations Board has issued a compilation of rules it has found to be illegal — and rewritten them to illustrate how they can comply with the law. Specifically, the memorandum points out employer policies found to violate and conform to Section 7 of the NLRA. Section 7 mandates that employees be allowed to participate in “concerted activity” to help improve the terms and conditions of their work. could be construed to restrict protected Section 7 activity. One thing the memorandum makes very clear: extremely subtle variations in language could be the difference between having a legal policy in the NLRB’s eyes and having one that’s viewed as violating the NLRA. Illegal: “Do not discuss ‘customer or employee information’ outside of work, including ‘phone numbers [and] addresses.’” The NLRB said, in addition to the overbroad reference to “employee information,” the blanket ban on discussing employee contact info, without regard for how employees obtain that info, is facially illegal. Illegal: “Never publish or disclose [the Employer’s] or another’s confidential or other proprietary information. Never publish or report on conversations that are meant to be private or internal to [the Employer].” The NLRB said a broad reference to “another’s” information, without clarification, would reasonably be interpreted to include other employees’ wages and other terms and conditions of employment. Illegal: Prohibiting employees from “disclosing … details about the [Employer].” The NLRB said this is a broad restriction that failed to clarify that it doesn’t restrict Section 7 activity. The NLRB said the rules above “were unlawfully overbroad because they reasonably would be read to require employees to refrain from criticizing the employer in public. The NLRB said the rules above are legal because they wouldn’t lead an employee to believe they restrict criticism of the company. Legal: “Each employee is expected to work in a cooperative manner with management/supervision, coworkers, customers and vendors.” The NLRB says employees would reasonably understand that this states the employer’s legitimate expectation that employees work together in an atmosphere of civility. The NLRB said the rules above were unlawfully overbroad because employees would reasonably construe them to restrict protected discussions with their co-workers. The NLRB said the rules above were legal because: “when an employer’s professionalism rule simply requires employees to be respectful to customers or competitors, or directs employees not to engage in unprofessional conduct, and does not mention the company or its management, employees would not reasonably believe that such a rule prohibits Section 7-protected criticism of the company. How can you reconcile conflicting laws and keep your workplace both safe and compliant? It’s a Catch-22 with big implications for your workplace: Marijuana is a Schedule I controlled substance under federal law — in other words, illegal. Yet many states have legalized marijuana for medicinal and even recreational use, with new laws being passed all the time. As an employer, you may have an obligation to accommodate employees who use marijuana for medical reasons, or you may want to relax your policies to cope with a talent shortage. But can you reconcile the conflicting laws in this area and keep your workplace both safe, compliant and competitive? Back in 2013, during the Obama administration, Deputy Attorney General James M. Cole released a memostating that a few key marijuana enforcement priorities were particularly important to the federal government. These included, among others, preventing marijuana distribution to minors; preventing revenue from marijuana sales going to criminal enterprises, gangs and cartels; and preventing drugged driving, gun violence and other adverse health consequences. The Cole Memo, in other words, articulated a largely hands-off approach on the part of the federal government when it came to states’ passage, administration and enforcement of their own marijuana laws. “At last count, there are approximately 30 jurisdictions that have medical marijuana statutes; only about 10 deal with recreational usage,” Linda Hollinshead, a partner in the Philadelphia office of Duane Morris LLP. “Medical marijuana impacts drug testing and drug-free workplace policies,” she said. “Also, there’s a high probability that an employee on medical marijuana is disabled, bringing in ADA concerns and concerns about discipline and discharge.” She noted that a lot of the laws make clear that employers don’t have to tolerate employees who are “under the influence” at work, but the standard for incapacitation is not clear. Many state marijuana laws have carve-outs, Hollinshead said. Most, for example, provide that you are not required to violate federal law. The Drug-Free Workplace Act of 1988 requires a drug-free workplace policy for organizations receiving a federal contract over a certain dollar amount (currently set at $100,000), as well as organizations receiving a federal grant of any size. State marijuana laws also have no bearing on drug-free requirements and testing imposed on safety-sensitive transportation employees by the U.S. Department of Transportation. Employers don’t have to tolerate performance, conduct or safety issues, said Hollinshead. She said that oftentimes when an employee is tested for reasonable suspicion and there’s a finding of marijuana usage, a decision can be made without referencing the test results. “Typically, when this issue comes up, it’s because something else is amiss — usually that’s the safer issue for discipline,” Hollinshead said. “If you have discipline and discharge policies for underlying conduct, you can rely on those.” This would mean, for example, disciplining or firing the employee, not for the positive marijuana test, but because he or she punched a co-worker, crashed a warehouse vehicle, or had a lengthy history of safety violations. Recent case law: A shifting tide? Up until about six months ago, Hollinshead said, employers were winning state law cases brought by employees who were not hired, or fired, due to marijuana usage. The employees were claiming failure to accommodate under the ADA, independent causes of action under state law or entitlement to off-duty usage. The courts, in ruling for the employers, said marijuana is an illegal drug under federal law. But recently, she said, three cases (from Rhode Island, Connecticut and Massachusetts) have gone the other way; the courts ruled that the federal Controlled Substances Act is not intended to pre-empt state law. Time will undoubtedly bring more clarity to the issue of workplace marijuana testing. Unfortunately for employers, “it’s really an unsettled area right now,” said Hollinshead. AZ HR Hub can help you navigate your obligations. A job description need not account for every task that might ever be done. Here are the most critical components of a good job description. Heading information.This should include job title, pay grade or range, reporting relationship (by position, not individual), hours or shifts, and the likelihood of overtime or weekend work. Summary objective of the job.List the general responsibilities and descriptions of key tasks and their purpose, relationships with customers, coworkers, and others, and the results expected of incumbent employees. Qualifications.State the education, experience, training, and technical skills necessary for entry into this job. Special demands.This should include any extraordinary conditions applicable to the job (for example, heavy lifting, exposure to temperature extremes, prolonged standing, or travel). Job duties and responsibilities.Only two features of job responsibility are important: identifying tasks that comprise about 90 to 95 percent of the work done and listing tasks in order of the time consumed (or, sometimes, in order of importance). The first task listed should be the most important or time-consuming one, and so on. Employers can cover 90 to 95 percent or more of most tasks and responsibilities in a few statements. It’s more important to list what must be performed and accomplished than how, if there is more than one way to do it. Being too specific on how to accomplish a duty could lead to ADA issues when an employee asks for an accommodation. Creating and maintaining job descriptions isn’t difficult. In fact, sometimes businesses use the development of job descriptions as a means of opening new lines of communication with employees. Employees want to be heard, and the development of job descriptions is a perfect opportunity to increase employee involvement. If employers approach the process correctly, it can even be fun! The reward for management is a useful tool that helps guide many critical employment decisions and serves as an important consideration in the defense of administrative actions and lawsuits.